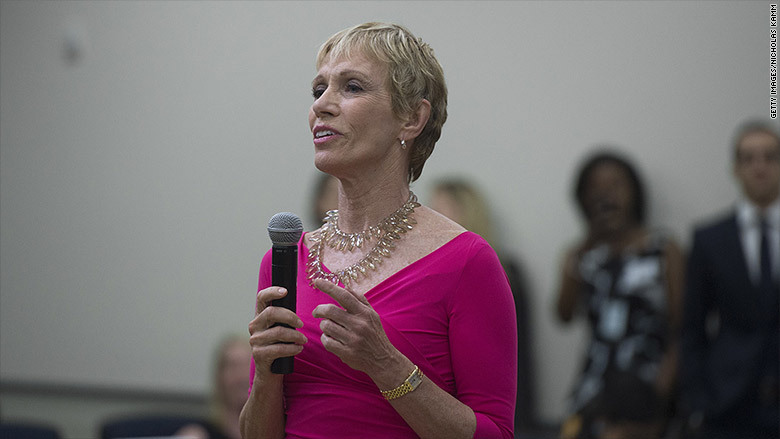 Barbara Corcoran said that when it comes to being a woman in business, "I'm just as tough and mean as the next guy." Entrepreneurship is the way to battle some of the world's toughest issues, according to President Barack Obama and investors from the hit show Shark Tank. Both the president and the sharks spoke about the importance of innovation at the White House Emerging Global Entrepreneurs event Monday. The event hosted people from 20 countries. It was meant to underscore the importance of investing in businesses working to solve global issues like poverty and climate change. "When you go to some of the toughest places in the world, where violence and deprivation are sadly daily facts of life, what people are most eager to hear about are opportunities to start a business," said President Obama. Entrepreneurs in the audience included Jimena Florez, a woman from Colombia whose fruit snack company is helping people make better food choices, and Adepeju Jaiyeoba from Nigeria. She helps save the lives of babies and mothers in rural communities by training birth attendants and delivering sterile medical supplies. Obama called entrepreneurs like Florez and Jaiyeoba "the face of change." Members of the audience also had the opportunity to hear from Shark Tank's Mark Cuban, Barbara Corcoran and Daymond John. Cuban said that today, entrepreneurship is as accessible as ever, and available to anyone with a smartphone or laptop. He said it's important to get the message out that anyone with an idea should have the opportunity to try and make it happen. For him, investing is how to affect change. "I want to help other people live the American dream," he said. "I want to be part of that thing that changes everything." Corcoran said investing in businesses is the closest she gets to doing magic. "You actually feel pretty powerful in a God-like way," she said. Corcoran said that while she has eight businesses that are doing very well, she has invested in 12 businesses that she's lost money on. She said in all cases, it was because the entrepreneur didn't "have it." Now, she said, she won't buy into a business "unless I fall in love with the entrepreneur lock, stock and barrel." "It's OK to screw up and try different things," Cuban said. "When you find something you love, it's always easier to be really good at it."